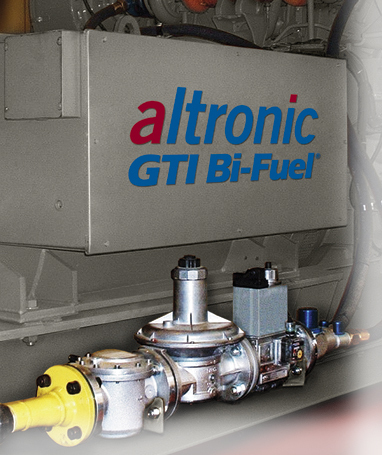 The GTI Bi-Fuel® System from ALTRONIC, LLC is an innovative technology that enables operators of heavy-duty diesel engines to substantially reduce operational costs and lower emissions by substituting diesel fuel with lower cost, cleaner-burning natural gas. The Bi-Fuel® System is comprised of patented technologies that allow engines to safely operate on gas percentages up to a maximum of 70% (subject to gas quality and other application conditions) of the total fuel requirement. Engines converted to GTI Bi-Fuel® exhibit diesel-like performance in such critical areas as efficiency, stability and load acceptance.